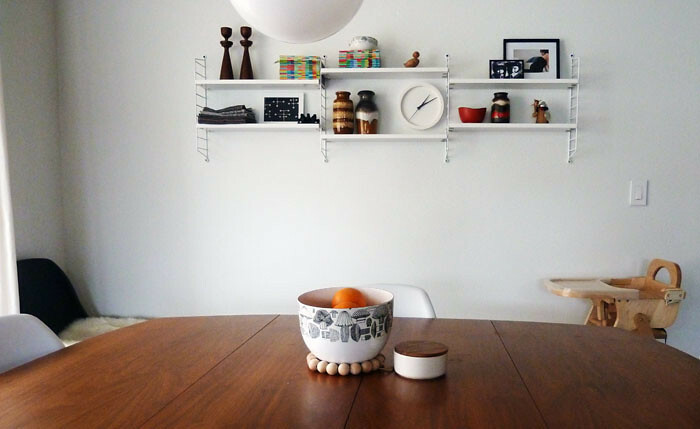 Got both Strings up in the dining area, we like them a lot! It's been a week since we took our road trip to IKEA, that went by fast. I don't mind the drive, but that may be because Jeremiah lets me sleep for the first couple hrs until I wake up dazed and confused about 3 hrs out. He's a good husband, letting me sleep like that. I returned the favor on the way back of course. We bummed my grandpa's SUV for the trip, which has no working radio or CD player, lucky us. I don't know how we passed the time because we didn't do much talking. You know how when you're first dating, or married, there's always so much to talk about? I guess we're old farts now because we both enjoy the silence. 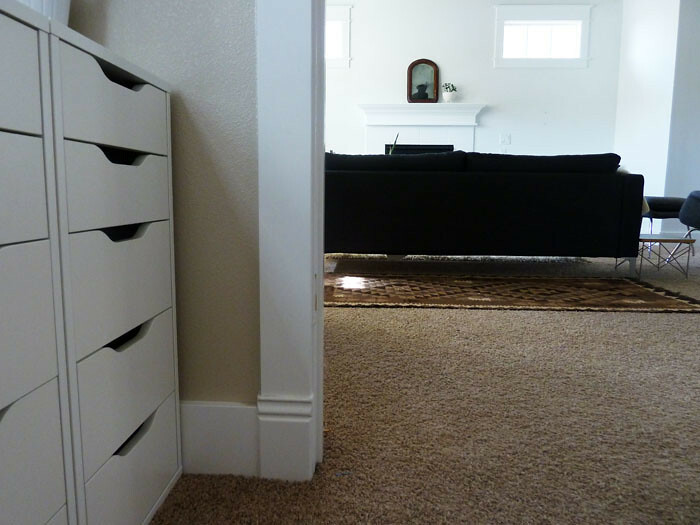 Anyways, we wanted to get some storage system for the office and decided on a trio of these VIKA ALEX drawer units. They're made to support a table top but I like them freestanding and they store a lot of paper, neatly. I also fell in love with the new STOCKHOLM lamp, I think we can all see the resemblance to this, right? I first saw it here but didn't think it would be available yet. There were only two in store. It's really high quality, sturdy and beautiful. I doubt I'll ever own the $800+ real thing so I'm quite content with this. We also bought some shelves for Israel's bedroom, he's becoming a light weight toy collector so I've got to make more room. We didn't do too much damage, it wasn't a let's-stock-up-for-the-rest-of-the-year trip. Oh, and a non IKEA item I recently purchased, this cute little German made play stove top. I need to find a better ledge for it but it seems to be the right height on the living room table. He is already pretending to feed me soup from his ladle and turns the knobs. He's by far the best thing I have! 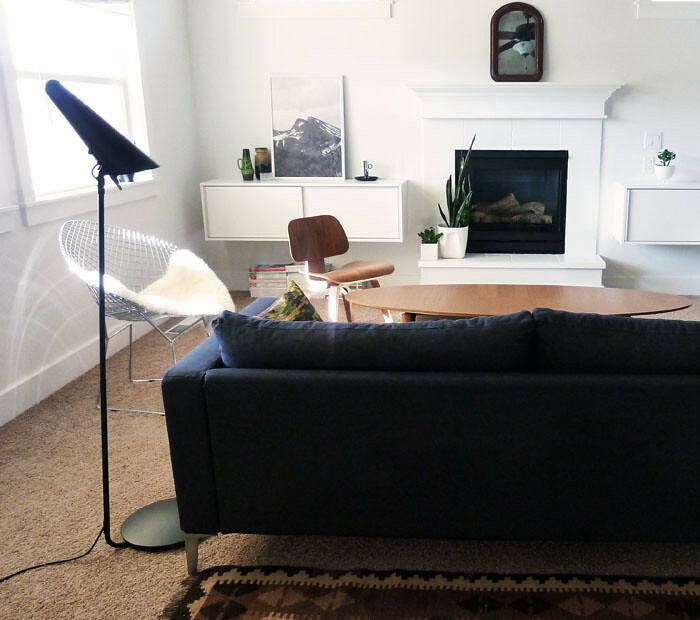 love the eames wood chair in the living room. jealous! 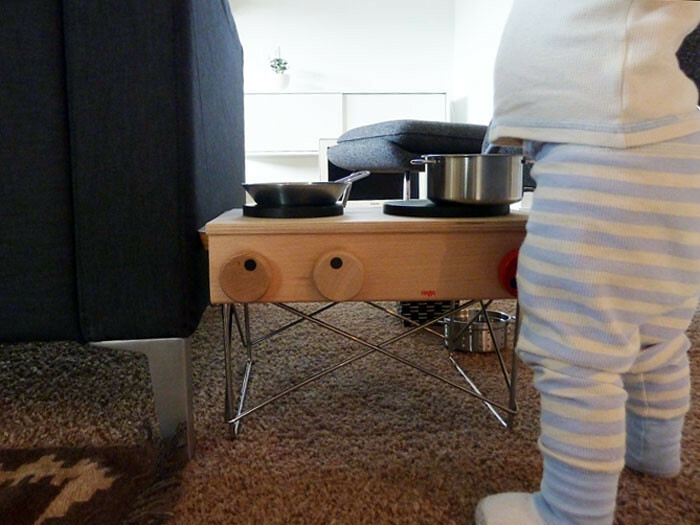 for your next trip to ikea - we also have that play stove top, and for ages, I put it on top of a Bekvam stool. we put non-slip grip on the edges, and it also functions as a sink step stool and also a small table/chair when my youngest wants to have a snack with me in the kitchen, and now it's used by my oldest at his art table. it's served many purposes in our household! for a little while, i also set up that stove in the kitchen by clearing out one of the low cabinets and storing that plus a bunch of toys and empty containers for my son to use when he was small. then i could keep an eye on him while i was cooking. i love that stove! That mushroom bowl! What is it called? A friend has one and I absolutely adore it. But he has no idea where it came from and when I look on the bottom, I don't see any markings. Love the little stove. Great when they get cooking early on. Mine love to cook raw chickpeas and coffee beans. Love your place, look so calm and relax, and all the things you bought are very, very nice, and your son is so cute those little legs cute, cute : ), my son love to help me make breakfast he think he is a chef : ) . Oh and the strings look perfect. I'm looking forward to your posting anytime! Thanks for this your news. I'm interested in a string furniture this time specially. It seems I can get in my country too. Are you set up at dining room? oh the string (& everything else) looks great! gorgeous home. and that mini stove is the topper. so chic for the little one. love it! ah the string. I've wanted it for so long, but our current rental doesn't let us nail (or screw) anything into the wall. Guess I'll just have to pony up the cash and then hold onto it lovingly until the time is right. Love the Finel mushrooms. I have a big bowl and a handled pot that I just love!! ikea can be dangerous! looks like you left with some smart purchases though - i love that lamp! Very cool. Love your sense of style. I love your Ikea buys ! I considered both the Aspvik and the Alex cabinets at one time for my hall, but ended up going with something else completely. I still wish though I had enough room for either (or both) of them - they're probably my favourite furniture from the Big Blue & Yellow. Aaahh, the Stokholm lamp. I saw it in the shop last week and the AJ connection immediately hit me as well :-) Like you, I'll never be able to afford the orginal (it sells for a crazy 700 eur around here), but I might just get this Ikea version for my office area... Luckily, there's an Ikea just around the corner from where my Mum lives - which definitely makes the decision process easier! 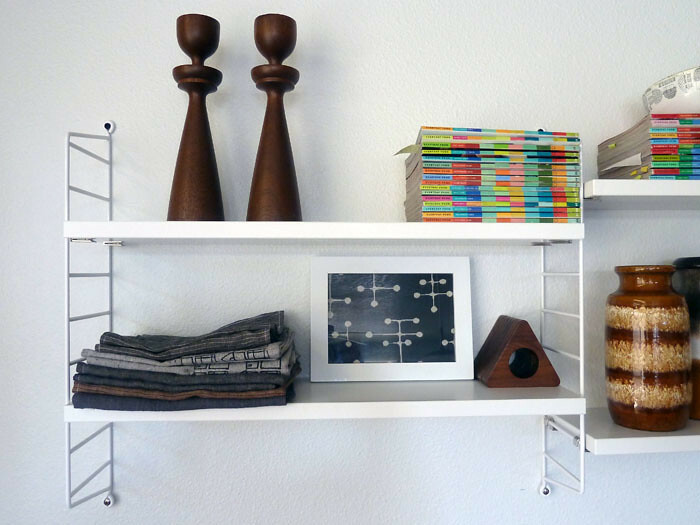 the string shelves look so great. love them. also, where did you get that little stove?! perfect. that stove is so cool! and I love the highchair! where did you get it?